In the world of architecture, “programming” refers to the intended utilization of a space. For instance, the program of a bedroom is a space to sleep. Now that’s simple enough—most bedrooms are relatively similar. But when it comes to the entertainment room, there’s far more freedom to get creative. After all, we entertain ourselves in different ways. While you may prefer to drink coffee, read books, and play chess in your entertainment room (which forms the program of the room), I may prefer to have guests over for the ultimate movie experience. So, while your entertainment room may have plenty of natural lighting, a chess table, bookshelves, and other features, my entertainment room might house a few cozy couches, a projector, and a surround sound system. A poker table, pool table, foosball table, etc. Now that you know what you’d like to have in your space, it’s time to organize the space. 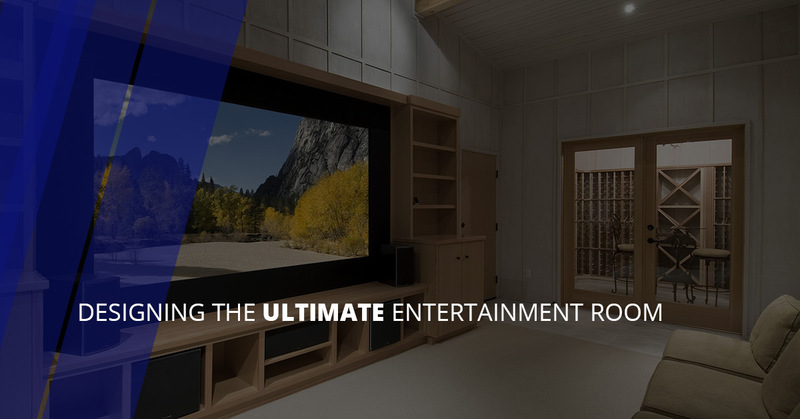 Consider how much space you’ll need for each item in your entertainment room. Also, make sure that there’s plenty of room to flow through the space. 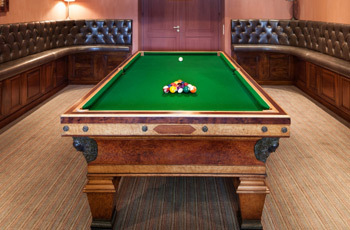 If you’re planning on putting a pool table in your entertainment room, for instance, then you’ll need room for the table, as well as room for the pool cues as players make their shots. Are you planning on having seating throughout your entertainment room? Perhaps a sofa or two in front of the television? What about a coffee table, or an ottoman? Organize your entertainment room space so that you’ll have plenty of room to place the amenities and furniture that you desire. What materials would you like to have in your home. If you have a rustic design, you might opt for exposed timber, plaster and stone walls, simple cotton shades, and wooden floors. Thinking more modern? Maybe you’ll opt for a bar with composite countertops and stainless steel barstools. Venetian shades will line the windows, and tile flooring will be installed, and eventually covered with various shag rugs. When you’re selecting materials for your entertainment room, remember to consider the house as a whole. Assess materials for by their character, color, and feel. Proper lighting is essential for the entertainment room. First off, consider natural lighting versus artificial lighting. If you have a TV in your entertainment room, you’ll likely want to have more artificial lighting than natural lighting—you may not even need windows at all (or you may opt to have dark curtains which can block out the light during the daytime). Are you going to want recessed lights? Or perhaps hanging lights that reside above a poker table. Certainly consider putting your lights on a dimmer switch as well. Built-in shelving always adds to an entertainment room. Whether you have a collection of books, a collection of DVDs, a collection of albums, or anything else, you’ll need shelving to store your media. Once again, consider the materials of your shelving as well. Design doesn’t stop there. Consider staggered, stadium-seating couches in front of your projector screen. Or install custom colored lighting that changes with the click of a button. For the musician, you might clad your wall with hanging equipment to display your guitars, ukes, and banjos. Need extra space to entertain? Opt for an open design between your kitchen and the entertainment room, or build in a garage-door wall that opens up to a patio. Once again, the possibilities are endless, so don’t hesitate to get creative with your entertainment room design! Here at Drafter Max, good design is a call away. We’re a Brooklyn-based design and drafting firm. Count on us to bring your designs to life. Learn about our full list of drafting and design services, and get in touch with us to get a free quote!